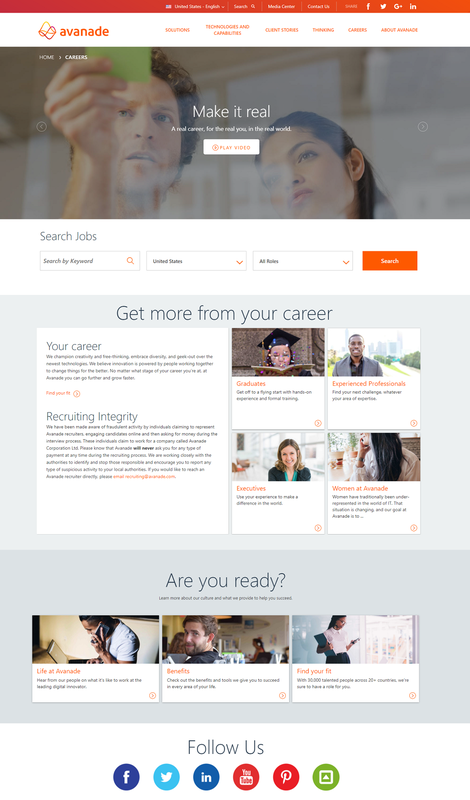 If you want to have the best company career page, look at some of the career home pages below. Some are terrific all the way through and others have a couple of awesome ideas you can borrow. Headline — They use a headline…sort of (it’s 75 words)…about what they value in a candidate and what the candidate gets in return. We don’t see this very often. Again, it feels authentic/unique. Great hero media — It’s an authentic-feeling video of what looks like the back of one of their store locations. Teams — They break down their teams by a few different brands they support (Amazon AWS, Microsoft Cloud, VMware Cloud, Google Cloud, etc.) — leveraging other top brands for your jobs is usually a good idea. Locations — They treat their locations as true destinations (e.g. a guitar icon for Austin, Texas). It’s a nice touch. Social Proof — They mention a handful of employer of choice awards. Global — They show clearly how they are a global company. “Work on the Latest Tech” — This headline gives a great answer to the question of “why” a technical person wants to work at Parsable (or anywhere). Techies love to work on the latest tech. A good rule of thumb: Always mention other brands if you work with/on them! “Where We Come From” — Again, the narrative they are using is a bit more of a story. It’s important to know where employees came from and because they mention many name-brands, it’s additional social proof. Technical Advisory Board — You don’t see this every day. They mention their tech advisory board on the career home page. They even mention where the board member came from. If you’re a technical candidate, this is going to stand out. An overall clean look (less is (often) more! I could use your help. When you’re creating a company career page, you’re going to need to point to the jobs you are trying to fill. I’d be grateful if you gave Ongig a whirl for your job description search. We just partnered with Google and their artificial intelligence to give you the most effective job search which then leads to the best looking and most engaging job descriptions ever. Do me a favor and request a demo to see Ongig’s latest! Thank you!